Watch Lizzie put a twist into the traditional Old French recipe! 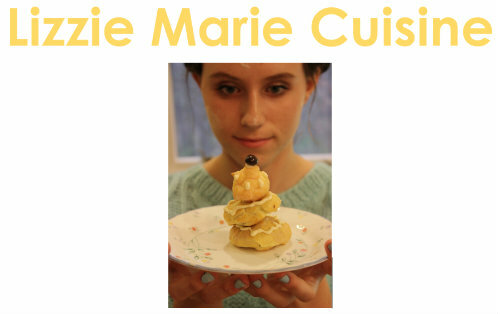 After accepting a teacher’s challenge to cook blancmange, Lizzie adds a decadent twist to a French classic. Dissolve cornstarch into 1/2 cup of milk in a small bowl by whipping it with a fork. Carefully bring 2 cups of milk to a boil in a pot, make sure not to scorch (burn) the milk. Lower heat to medium and whisk in cornstarch/milk mixture, sugar, and cocoa; whisking constantly until thickened into a pudding. Remove from heat and whisk in vanilla. Pour into either one medium serving bowl or individual small serving cups. Do not place hot pudding into refrigerator, let it cool first. Place a piece of plastic wrap onto the top of pudding before chilling in refrigerator. The plastic wrap pressed onto the pudding will eliminate a skin from forming as it chills. Chill for a couple of hours in refrigerator. Remove plastic wrap before serving. Serve with a dollop of fresh, whipped cream or a few fresh raspberries. Sunday Night Football! How About a Salmon Dip? It's quick and easy to make, and tastes terrific. A perfect spread for fresh vegetables, bagels, or pita chips. Beat cream cheese in a mixer until smooth. Add remaining ingredients and mix well. Chill for at least 1 hour. Serve with a variety of dipping devices: vegetable spears – zucchini, carrots, celery, or red bell pepper. Whole grain crackers and pita chips make delicious dippers too.